The day was supposed to be filled with rain, but we were fortunate enough to only get some lite showers for a couple ours around lunch time. I sat underneath a spruce tree which shaded me from the rain while I ate turkey jerky and granola bars. It wasn't too bad although a bit chilly (my thermometer said 53). I stayed warm by zipping up my rain jacket and huddling next to the tree. My 2 favorite parts of the day were the spruce forest and the view from Beauty Spot. Both offered their own unique splendor and mysitque. I rolled into camp at 4:30 and did my chores. The sun is just now trying to make its way through the clouds while I lay here in my tent typing before getting ready to eat dinner. Is that a ULA pack you have there? I've been eying their gear for a few months. I actually have the Catalyst bookmarked for possible future purchase. I've been wondering about the durability of the materials and also the comfort. How do you feel it sits on your back fully loaded? I love the pack! It is constructed very well and I haven't had any problems with it at all. The only negative is that it's hard to find a place that you can actually try one on as they are a cottage type industry company. More outfitters are starting to carry them though. I would recommend trying any pack on first before purchasing one just because everyone is built differently. I would hate to give you the wrong advice on that, but I love mine (for me). Thanks for the info man I appreciate it. 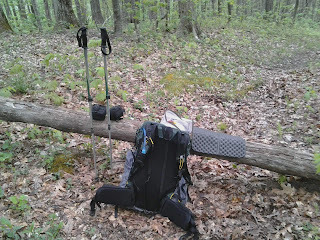 I'm currently using a Kelty Coyote 80. At 5.5lbs it's a little heavier than I'd like but for where I hike, it's been great. Eventually I'd like to cut my weight down here and there but I'm in no real rush. I'll def keep my eye on these ULA packs.